Jaro Rehabilitation Centre: y.architects with ThinkCity are progressing with upgrading works for the centre undertaken by local contractor, Brightcon. The centre will include barrier free access and disability friendly strategies in a green environment. TEKland Shops: Contract for 110 units of 2 and 3 storey shops are awarded to Haily Construction. Daiman 18 Pekin Restaurant: The construction of a new 150-tables Chinese restaurant is completed with an aesthetics that is a departure from the norm: raw cement, common bricks, natural lighting and strictly modern. Design of the restraurant takes a direction of clarity where form follows strictly function. Women Maternity Hospital: Construction for a 3-storey private hospital in Johor Bahru is being carried out by Telford Corporation. Permas Terrace Houses Zone 2-3: Building Submission is approved for 272 units of terrace houses which sports barn aesthetics with lofts and industrial detailing. Senibong Hills C3, JB: Syarikat Pembinaan KIan Heng were awarded the contract to build 69 hillside terraces and 169 units hillside apartments. Emerald bay Site Office: y.architects received a commendation in the Malaysia Wood Awards 2017. Though temporary in nature and not build to last, the building was significant in the reuse of wood components in the building industry. It pursues the idea of sustainability. Heritage Row Tan Hiok Ngee: y.architects had just completed measure drawings and study of the iconic Ee He corner shophouses for rehabilitation. Emerald Bay Clubhouse, Puteri Harbour, Johor: y.architects' implementation of WATG's new iconic private clubhouse for BRDB's Emerald Bay has completed and hosted a grand opening with the Malaysian Philharmonic Youth Orchestra performing on a floating stage. Senibong Cove B5B6, JB: Building Submission is approved for 129 landed strata homes and 491 units apartments for these Canal Residences. UTM Praxis Seminar on Green Building Practice: y.architects delivered a presentation on green buildings to UTM students and staff. Edible Park, Medini Johor: Construction for the 2 park pavillions are underway. On completion in March 17, the Park buildings will house workshops, cafes, etc to complement the park activities. Designed in colloboration with Johor Green, these park buildings epitomise tropical architecture with their green facades and deep creepers overhangs. Penawar Sentral: Building Approval was received for 224 units of 2-storey shop offices in the bustling town of Bandar Penawar, off the east coast of Johor. 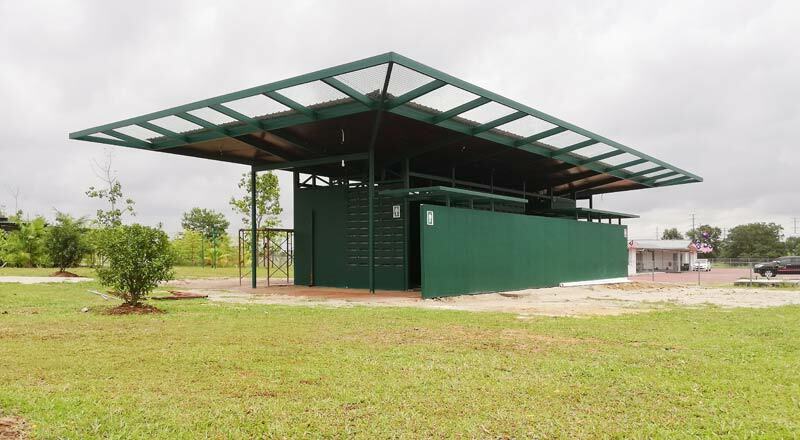 Sebana Cove: 40 units of double storey tropical courtyard bungalows facing the golf course off the south east coast of Johor are completed with ccc. Bungalows feature courtyards and pavillions that epitomise tropical living..
Anggerik Terraces: 81 double storey terraces featuring deep overhangs, double skins and vented eaves for passive solar control are nearing completion. Horizon Hills Ph7C7H, Nusajaya, Johor: Building Plans approved for 38 modern pristine white bungalow designs. It was developed for a wonderful golf course facing site. Views take predominance. Careers Talk, SMJK Permas Jaya: Associate Jiih Kui giving career guidance talk to secondary school students on "A Career In Architecture". Datum, KL Architecture Festival 2016: y.architects' presented a paper on the studio's projects and activities on the subject of "Future Communities". Fiabci Prix d Excellence 2016: y.architects' projects Batu Batu and Senibong Cove won Gold and Silver in the awards ceremony held in Panama! Bandar Alam Masai: Building Plans Approval are received for 320 units of 2 and 3 storey shops in this new township containing a hypermarket and a transportation terminal. Taman Gaya Sales Gallery: Contract for the Community Sales Gallery is awarded to Brightcon. This tropically themed gallery will feature amongst others, punch through roofs, marine ply ceilings, tree columns and silk screen concrete. Thompson Medical Hospital: Building Plans for RSP Singapore's Hospital are approved for a 33 storey building in Johor Bahru. UTM Praxis Seminar on Green Building Practice: y.architects delivered a presentation entitled Romancing The Tropics to UTM students and staff. UCT Sarawak visit: 25 students and staff led by Andy, Ms Wong and Oliver visited y.architects and had an afternoon stroll along the rivermouth boardwalk of Senibong Cove. They were introduced to the sustainable efforts of Senibong Cove and waterfront living. Cub8teens (18s), JB: Building Works are nearing completion and it is turning out to be a sophisticated addition to the cluttered surroundings. The language is of uncluttered clean lines and reductive detailing set in a dark rendered background. Senibong Cove: Winner of Fiabci's Malaysia Property Award 2015 for the Masterplan Category and Environment Category! Batu Batu: Winner of Fiabci's Malaysia Property Award 2015 for the Resort Category! Senibong Cove: Front Concept won 2 awards in the South East Asia Property Awards 2015 in a ceremony held in Singapore's Shangri-La Hotel. One of the winning projects is the Isola Grandeur for the Best Villa/Housing Development Category. Presenters: Alvin Choo (landscape architect-escape), Cheah Kok Ming (assoc prof-NUS), Chan See Siong (renewable energy enthusiast), Claryl Chan (student-raffles ui) and Alex Kee (environmentalist entrepreneur). Senibong Cove: Front Concept won a massive 4 Awards and 1 High Commendation in the South East Asia Property Awards (Malaysia) 2015 in a glittering ceremony in JW Marriot KL. Included is the Best Housing Development (Malaysia). Cube176, JB: Constuction of the 1st phase is nearly completed for 176 units of minimalist form terrace/cluster houses at Kangkar Pulai. It follows from the the cubist theme of cult deisgner Joseph Lee. Taman Gaya 4C, JB: Contract for 123 units of clusters, semid and bungalows for Phase 4C has been let to Fook Yu. Design Forum 2015 on Sustainable Architecture, PAM Sarawak, Kuching: y.architects presented talk on sustanability entitled "Climate Place Time" at the BCCK, Kuching. Leo Club SMJKPJ1, JB: Yew Peng and Yvonne Yap gave career outline for Architecture in a Lions Club JB sponsored event for SMJKPJ1 Leo Club which was attended by 200 Fifth Formers. Isola Grandeur, Senibong Cove, JB: Showhouses wtih swimming pool and id are completed for viewing. Designs are derivative of the tropical environment taking advantage of greens, water and light. Outdoor living are promoted with strategies made to embrace the water and river biodiversity that surrounds it. Hilton Double Tree Hotel (35s)/(30s), JB: The hotel is completed. Trial stay has concluded and is now open for operations. Congratulations all round! PAM Awards 2014: y.architects received commendation award for Batu Batu Island Resort in a trendy black-tie ceremony at the Pullman Hotel, KL. Design Lecture: y.architects presented talk on Matahari School entitled "Planes Layers Form" at the PAM Centre in KL. Batu Batu: y.architects' Batu Batu is featured in the Vol 26 Issue 2 of Architecture Malaysia and had the edgeless pool gracing the front cover. Seventh Cove, JB (41s): Planning permit approved for twin blocks of sharp modern skyscrappers. Horizon Hills Ph6A1, Nusajaya, Johor: Building plans are approved for 68 units of high cost double storey semi-d homes. Homes face the rear gardens and golf course in a new definition of lifestyle. Tender drawings are being prepared. Emerald Bay Bungalows, Puteri Harbour, Johor: y.architects, together with RTnQ, are preparing building plans for Bandaraya's new iconic avant garde bungalows.